The first annual competition for the 'Inter-hospital challenge cup' was reported in The Field (4th July 1885). This took place from Putney to Hammersmith on 26th June and was contested by crews from The London, Middlesex and Barts - the London beating Middlesex by 1/3rd length. The race was started and umpired by E F Grun of LRC from the bow of a steamer which also contained supporters from the different hospitals. An extract from the Bart's Journal, 1955 (with thanks to QM archives). WHEN DISSATISFACTION was expressed in 1953 at the small number of crews competing in the United Hospitals Regatta, few people would have suspected that it would lead to Bumping Races being successfully held on the Tideway. The events leading up to the First National United Hospitals Bumping Races on May 18, 19 and 20 at Kew, are both amusing and bizarre, and certainly worth setting down. They were originally suggested by James Hadfield, then Captain of the U.H.R.C. 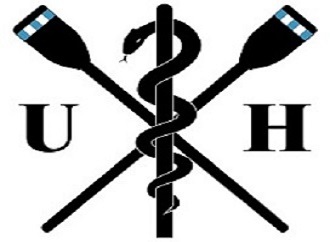 and S.T.H.B.C., as a solution to the problem of giving all crews racing in their own class, and to encourage more crews on the river. The first site proposed was the Thames at Kingston. But expense made this impracticable, and the question arose whether the races were feasible on the Tideway. A few were honest in their objections: bumping was a debased form of racing. made necessary elsewhere by the narrowness of the Fenland ditches and the streams at the source of the Thames. The majority were amused and sceptical, having visions of death and disaster in the inevitable shambles. The few enthusiasts believed that the original objection might be true of the foundation of such races at Those Other Places, but that the results of such racing justified trying them on a river where the geography did not make them imperative. Some experience of Bumps at up-river schools, who practise both forms of racing, tended to confirm this view. As a preliminary the Eights races were deleted from the winter regatta, and the decision about the nature of the summer Eights left to a later meeting. This alone produced an increased entry for the small boat events and a very good standard of racing. Some encouragement from the Watermen at Putney led to the belief that Bumping Races could be held cheaply there. and with this in mind the meeting appointed a committee to hold the races in May, together with any University of London crews they could persuade to enter. The fun then began. A starting place at Hammersmith was found which was exposed for a sufficient length of time at low tide, a course was decided upon. and the blessing of the Port of London Authority obtained. The latter, far from being official and obstructive. was most helpful. Consultations, taking place in a splendid launch off Lambeth Pier. Dr. R. J. Blow, L.M.B.C. and S.B.H.B.C. gave a lecture to coxes pointing out the intricacies of Bumping races. Then came a blow. The boatmen at Putney, upon whom so much depended. reported that they would be occupied on the chosen dates with preparations for a Regatta. Moreover, the other rowing clubs who were competing in this Regatta did not react favourably to the idea of dodging the Bump crews. So a change of course was vital. Once more the committee plodded through the sand and mud at low tide this time in the neighbourhood of Kew Gardens. The stretch seemed suitable. A shot gun was taken along in order to find out how far the sound would carry. The enthusiastic gunner used a 12 bore Magnum and tried a double discharge with 3 inch cartridges. The acoustic effect was satisfactory but, as the recoil cut his finger and nearly broke his nose, some other method of starting the crews was deemed advisable. Meantime sustained antagonism from the University College and Hospital coach played an important part in frightening off many, and eventually all, the University of London crews. However, the captain of U.L.B.C. placed his boathouse at our disposal and himself gave valuable support. Then a scare arose because the River Police gave a very different version of the Tides' behaviour on the selected dates. Fortunately the difference turned out to be one of terminology. The next problem was the crucial one of how to start the crews. And one morning. armed with an iron bar, a length of rope and a chock of wood, some members of the committee met the St. Thomas's Eight at Kew for a trial start In a strongish wind and fast stream considerable difficulty was experienced in holding the crew, and at the first attempt the eight went straight into the bank. However, by trial and error, a workable scheme was established two waders holding each crew. A boatsmith was commissioned to make the lines, stakes, bungs, and also rubber balls to fit to the prows of the boats. Meanwhile, attempts to get a Clock Firm to provide an Official Clock, and to get the H.A.C. or Yacht Clubs to provide suitable cannons met with no success. Further shooting trials were carried out to test the effect of cartridges without balls. These were unsatisfactory, and black powder blank seemed to be the only answer. Then R. W. Lister, the captain of U.H.R.C., contacted the C.U.B.C. and obtained permission to borrow the University cannons. Accordingly he set out for Cambridge with another Committee member in the latter's car the day before the races. Arriving in Cambridge rather late, one tyre went flat. And the drivers were a little upset to see two bullae in the spare one. However they set off again to find the Secretary of the C.U.B.C. who had apparently gone out sculling. After a hectic chase down the river bank. he was eventually intercepted at Grassy Corner and the necessary information extracted. Then, while the driver mended another puncture which the chase had produced, Lister fetched the cannons by taxi. And very late they set off for London. Somewhere near Hatfield they got yet another puncture which they wearily mended. Shortly after setting off again there was a loud report, and the car waltzed crazily to a standstill with an eviscerated tyre. Frantic phone calls and fervent prayers were made and the remaining tube patched up. In the gathering gloom they set off once more, only to be rudely stopped after another quarter of a mile by another report and burst tyre. As if the cannons possessed some malevolent hoodoo the elements joined in the fray and a heavy snow storm developed. The car had to be towed on two wheels to a garage in Potters Bar. where another member of St. Thomas's Boat Club fetched two very cold, wet and disconsolate individuals, and two brass cannons about which they were rapidly becoming paranoiac. A less promising eve to the event can hardly be imagined. Nevertheless, in somewhat chilly and changeable weather, shortly after 5 p.m. on May 18, a quorum of crews, constituting the second division of the United Hospitals Bumping Races, assembled on the Surrey bank opposite Syon House. They were marshalled by Mr. Jeremy Debenham, a former Assistant Secretary of the C.U.B.C., who, as befitted his legal status, dealt with all crises with admirable presence of mind and impartiality. The genie of the cannons had nearly exhausted his resources, and, with but one misfire. was rammed into submission by P. J. Scott. Thus, to a magnificent roar of smoke and flame, the boats were precipitated into the stream, and went headlong down the ebb tide after each other. The first guns were fired by a fellow of the Royal College of Surgeons, Mr. Frank Law, C.U.B.C., L.M.B.C., and the first bump was scored very shortly afterwards by St. Thomas' IV coxed by a Fellow of the Royal College of Physicians. Bart's considered it unnecessary to deny the subsequent rumour that they were going to embark an eminent gynaecologist, who could be counted upon to sink the first crew to founder in the races. Bart's III went off to a fine start. and, there being a bump in front of them, had no difficulty in maintaining their position at the bottom. In the first division, Bart's I started second and Bart's II fifth. The order of starting was arranged arbitrarily by the Cornmittee, based as much as possible on the performances of the crews in the racing the last time the cups were competed for, some 18 months earlier. At that time Bart's II contained three oarsmen who had rowed at Henley, thus they were now placed in a high position which they could not reasonably be expected to maintain. On the first night they were bumped by St. Thomas's II, and on the next night by Middlesex 1. On the last night they surpassed themselves and kept away from Westminster 1. On the first night St. Thomas's I failed to take advantage of the tide and Bart's I got within a quarter of a length, but, largely owing to inexperience of this type of racing, failed to press home this advantage. On the next night St. Thomas's went away, Bart's closing at the finish to just outside their distance. On the final night, Bart's went off fast and got to about one length from St. Thomas's who drew away again and finished at about their distance after a good race. On each night Guy's, who were third, finished well outside their distance from Bart's. To the Third Eight went the honour of making the first bump for Bart's. For, in spite of 4, making last minute, nay, last second, adjustments to his dress, they managed to leave their stake at the gun and bump the London II. Although on the final night they could not catch St. Thomas's III, who had been bumped by St. Thomas's IV, (for which they were fined three guineas) they managed to keep away from their erstwhile victims. The evil spirit of the guns was a hard one to lay, for on the second night it was apparent that powder was running out. Luckily the Metropolitan Police pushed through the procedure for a powder permit, which normally takes a fortnight, in time to keep the guns firing on the last night. Nevertheless disaster nearly overtook the guns of the first division on the second and third nights. On the second night the nimble fisted rugger player who was i/c Artillery contrived to discharge, by accident, the shotgun, held, ready in case of emergency, between the one minute and zero guns, nearly filling his assistant's ear with wadding On the last night the President's gold Hunter stopped after the minute gun, only the presence of mind of the Chief Umpire saved the division from chaos. In spite of vicissitudes the races went off without accident or serious hitch. By the third night a very fair order had been established. Perhaps a smaller distance between the boats will improve the racing, although this was in any case keen. Two things stood out. One is that the more crews there are the better. For every crew has a chance of making good. The other is that the number of spectators was disappointing. A small army of helpers was needed to get the races underway ; pushing out, counting down, etc. For Bart's, members of the rugger club and others performed their somewhat chilly offices with commendable skill. It seems a pity that more people could not muster even a fraction of such interest in order to come and watch. However, there will probably be another time, and there is a pub on the course.